Every year the fantastic Paines Plough bring their Roundabout theatre to my local area. It's an inflatable theatre that puts on engaging plays for adults and children. The plays are always some of our favourite that we go and see throughout the year and we are full of excitement when we see that massive yellow theatre in the distance. This year the Roundabout Festival headed to it's new location outside Pavilion Dance South West as part of the Arts By The Sea celebrations. 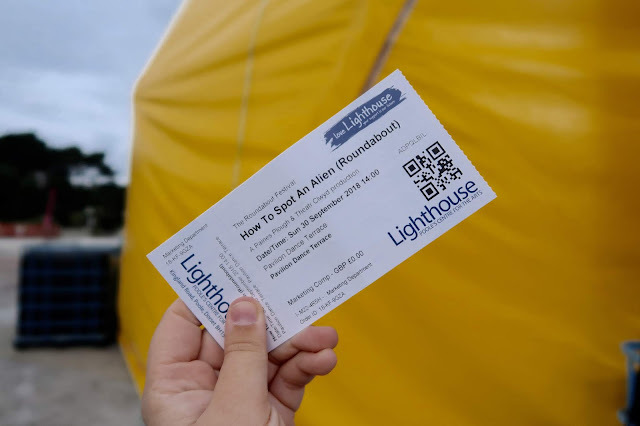 Still in conjunction with The Lighthouse, we got our tickets for How To Spot An Alien and couldn't wait to see what we had in store! 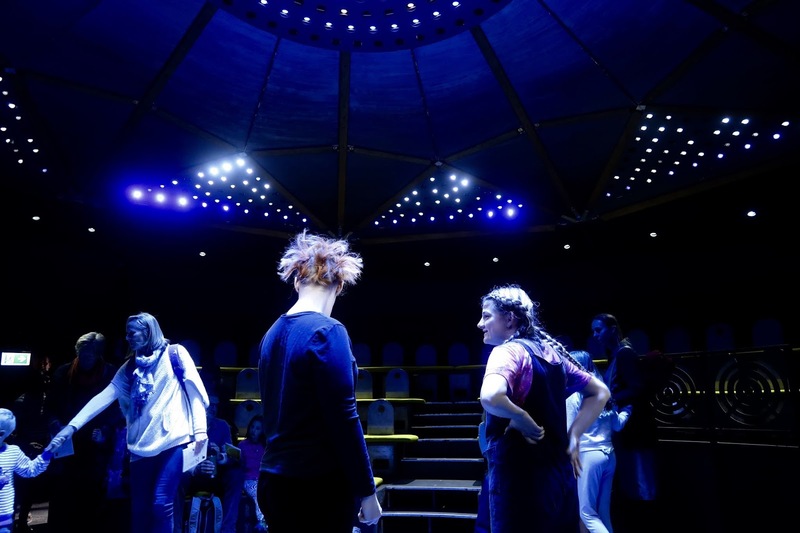 When sitting down in the Roundabout theatre you feel at home straight away. The actors mingle and chat with people, make everyone feel at home and get you geared up and ready for the show. It's a perfect way to calm the nerves of any new theatre goers, but also to give you a sense of excitement for what lies ahead. We were told that the play whilst it might have a happy beginning, would definitely not have a happy end. How To Spot An Alien is based on two children who have a fantastic mum. She knows everything about anything and can answer any question, even when you are supposed to be in bed. She even knows what's inside a black hole! But 12 year old Jelly and her brother Jonjo wake up one morning to find that their mum has disappeared, with a policeman looking over them informing them that the pair are headed to a foster home. As soon as they are packed up and ready to go, an unheard of aunt turns up to whisk them away and care for them. No sooner are they taken to live with their aunt Lena do they realise that something doesn't add up. Why isn't she letting them out, why aren't they allowed to ask questions, and most importantly, what's in the attic? What ensues is a chaotic and fantastic show about aliens, friendship and space. We honestly loved this show so much. Max was on the edge of his seat throughout the whole show and I loved how interactive and fast paced it was. It was a true blend of everything from The Witches to Hansel and Gretel and I absolutely couldn't love it more. The way that the actors used the space around them and simple props to keep you hooked is magical and I really appreciated everything from the clever lighting to the clever transitional movements. They ticked all the boxes. On top of everything though I have to say a massive well done to the three actors that put on the show. Not only did they do a great job at impersonating everything from children to aliens, they also keep everyone from little ones to adults transfixed with what is going on in the show. A true testament to the fantastic work that not only they do, but also what Paines Plough put together. It's on tour in a few more places and I highly recommend you take a look and head down to see if you can spot an alien, because I think I did! *Note: We were gifted tickets in return for an honest review. All opinions are our own.